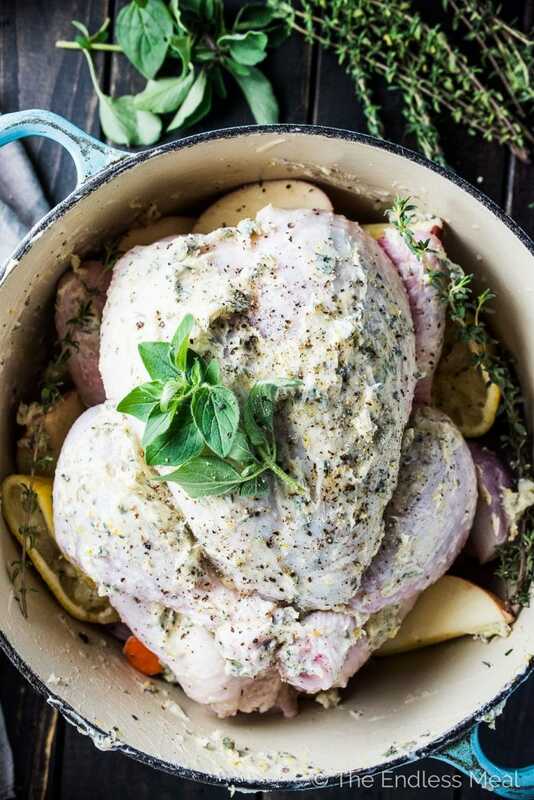 Lemon Herb Butter Roast Chicken is insanely delicious and a foolproof roast chicken recipe. 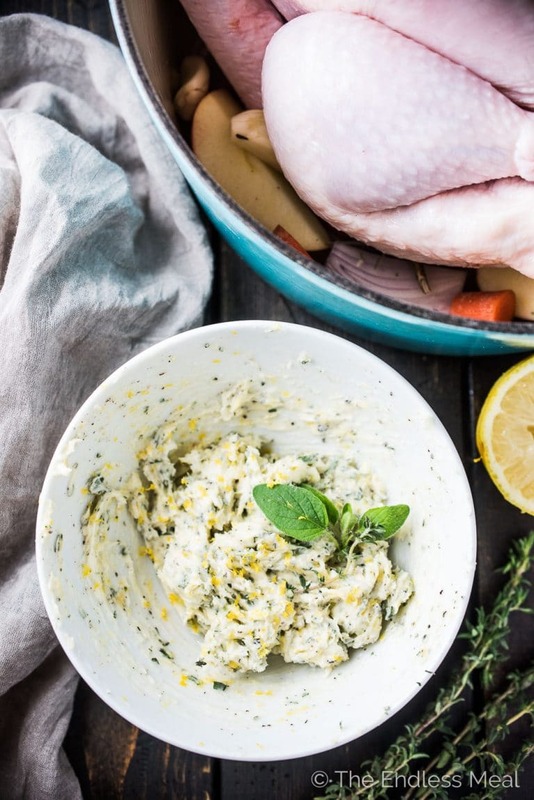 The lemon herb butter keeps the chicken so tender while crisping the skin perfectly. 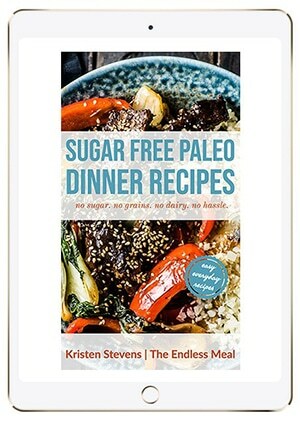 It's a healthy and easy to make recipe that's naturally gluten-free + paleo and can easily be made Whole30 compliant. 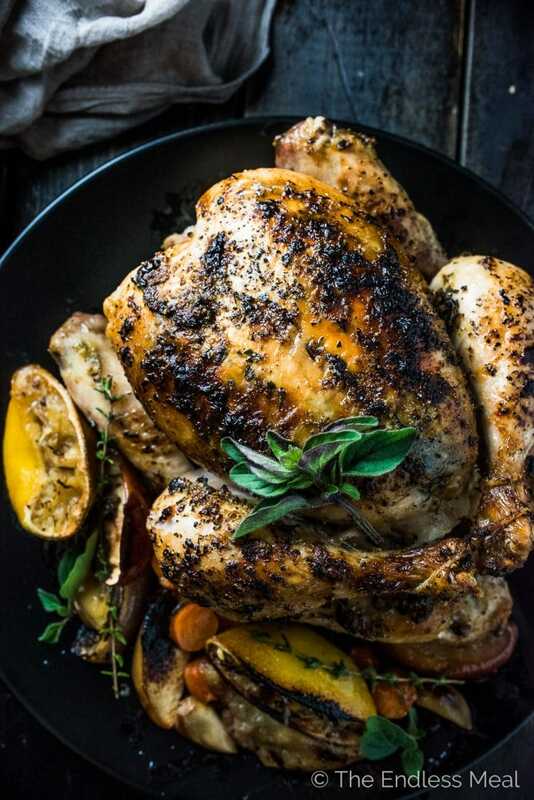 Say hello to the one and only roast chicken recipe you'll ever need: Lemon Herb Butter Roast Chicken. I'm talking about all the crispy skin, the tender, juicy meat, and the delicious gravy you get to spoon over the potatoes I know you're serving on the side. This is everything. The secret is the lemon herb butter. (You could totally use ghee if you're on The Whole30 Program.) It's mixed with lemon zest, tons of chopped herbs, and plenty of salt and pepper. You take that flavorful butter and spread it both under the skin and over the whole bird. Yes, under the skin means getting up close and personal, but it's worth it. Chicken breasts have a tendency to dry out. ← We don't want that. By sandwiching the butter between the breasts and the skin, you're guaranteed to have juicy meat. What's it like where you live? Is it as chilly as it is here in Vancouver? This time of year on the west coast is all about cold, miserable rains. Even with rainboots and an umbrella, it's hard to want to get outside. My inner homebody comes out full force around November each year. We've been on a bit of a roast chicken kick here lately. When the whole ‘let's eat roasted chicken twice week' thing started about a month ago, it had been ages since I made one. I kind of forgot how easy they are to make. 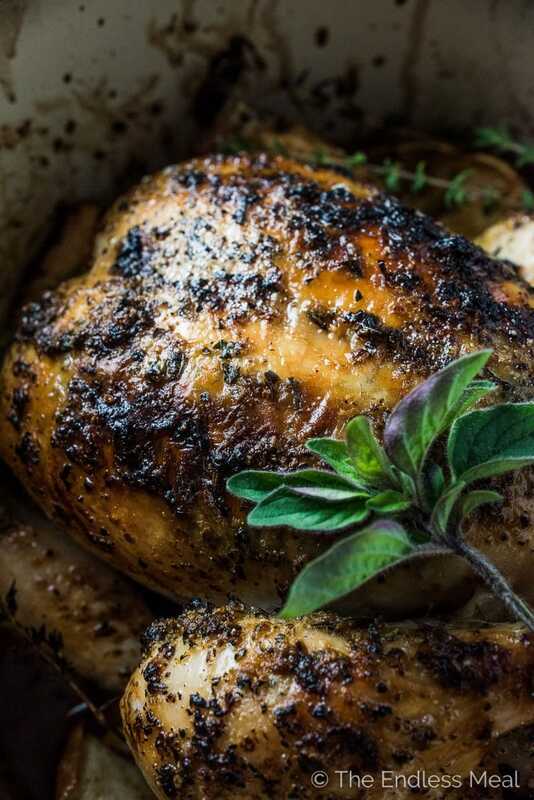 I mean really, all you have to do is rub some herb butter on a chicken and put it in the oven. I like to set the chicken on top of some onions and carrots, but you can even skip that part. 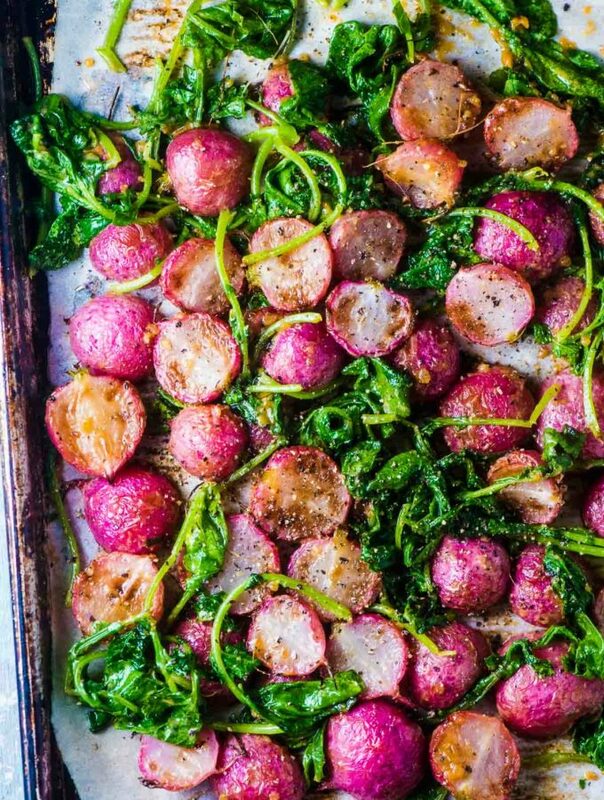 Pop some potatoes in the oven when the chicken is halfway done cooking and toss some salad greens in a simple lemon dressing and dinner is ready. The hands-on cooking time is only about 10 mins. See that lemon herb butter? That's where the magic lays. You're going to take some softened butter and mix it with some thyme, oregano, rosemary, garlic, and lemon zest. An (of course) plenty of salt and pepper, too. It gives the roasted chicken so much flavor. We've talked about how that butter helps to crisp the skin and keep the meat juicy, but it also plays another key role. That lemony herb butter melts into the “gravy” and makes it insanely delicious. And those quotes are on gravy because what I really mean is the juice that accumulates at the bottom of the pan. You could make a gravy out of it, but I like to spoon it over everything on my plate as is. 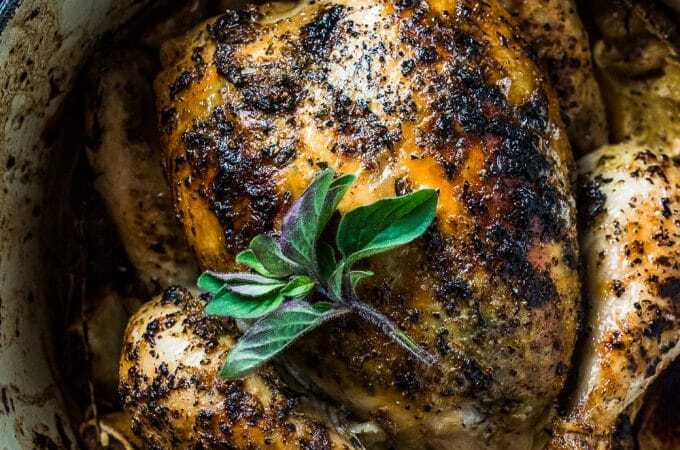 Lemon Herb Butter Roast Chicken isn't meant to be fussy or complicated. 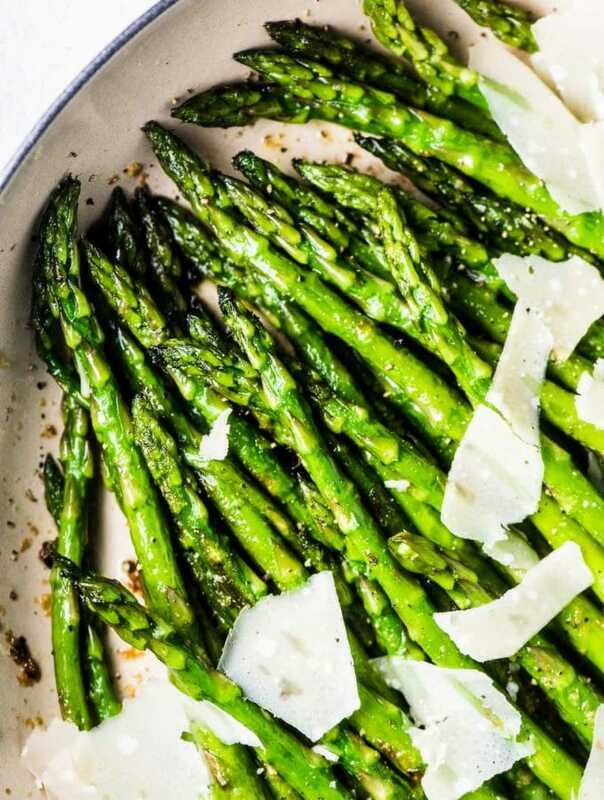 This is simple and delicious, feel good cooking. 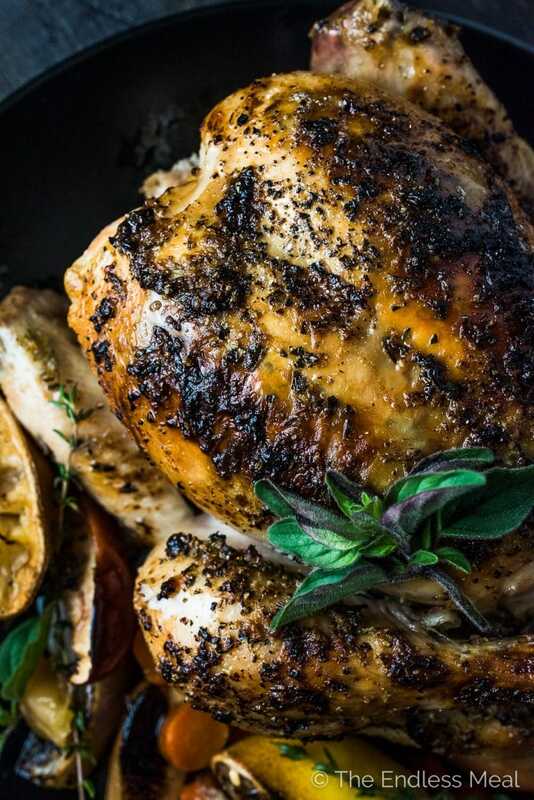 If you love this Lemon Herb Butter Roasted Chicken as much as I do, don't forget to leave a 5-star rating in the comments below! Cut the lemon in half and remove as many seeds as possible. Place the carrots, shallots, apple, and herbs in the bottom of a baking pan. Dry the chicken with paper towels then spread half the butter under the skin on the breasts. Using your hands, make small pockets between the flesh and the skin near the cavity side of the chicken. Stuff some butter into the pockets then use your hands to push it up over the whole breasts. Try to stuff some more butter under the skin around the legs. Be careful not to break the skin. Use half the butter under the skin and rub the remaining butter over the skin. Place the butter rubbed chicken on top of the veggies in the pan. Squeeze the lemon juice over the top then nestle the lemon halves beside the chicken. Roast the chicken for 45 minutes then turn the oven down to 350 degrees and roast for another 45 minutes. Remove the chicken from the oven and place it on a serving platter. Spoon the veggies out of the pan and place them beside the chicken. Discard the lemon and herbs. Pour the remaining juices into a bowl and serve beside the chicken. I’m so happy to hear you liked it! Horray!! Such a simple and beautiful recipe. The chicken turned out very tender. Will be making it again. Sounds awesome. However, Can you confirm the cooking time please. Seems very long for a 3 lb chicken. What time if using convection. Thanks.